The contact for these liturgical ministries is Christine Broses at 313-883-2863 unless otherwise noted. Please let us know if you’d like to be trained for any of these! Altar Server: Trained altar server minister on Sundays and Holy Days. Dependable persons who have (at least) started third grade and received first communion can volunteer. Baptism Assistant: Prepare the materials, greet the families, and assist the presider during the baptism. Baptisms are usually during Mass for parishioners and at 1:30 pm Sundays for visitors. Children’s Liturgy Leader: Adults and Teens lead children in unfolding the scriptures at a level they can understand weekly during Mass from October through May. Leaders are asked for a once or twice a month commitment on a rotating basis. Contact: Yvonne Graves 313-883-2862. Church Environment: Contact: Devon McElroy 313-883-2866 unless otherwise noted. BSC Environment Assistant: Help prepare the church for the major liturgical seasons. Pew Maintenance: Wash pews with Murphy’s Oil Soap and remove wax from fabric. Gifts of Talent in Building Trades: carpentry/plumbing/electrical/HVAC. Requires proper licensing. Let us know if you can help. Cathedral Clean Up with Fellowship: Deep clean in good company – with refreshments after! Cathedral Grounds & Flowerbeds: Weed, plant, prune, and such seasonally. Moses Beautification/Kitchen Committees: Help prepare/decorate for liturgies and deep clean. Watering Assistant: Water the plants in the church year-round. In warm months we also water plants outside the Cathedral. Sewing Assistant: occasional help is needed to sew various decorative items. Shrine Committee: Help with upkeep of the St. Peregrine shrine at St. Moses through fund raising and more. Contact: Darrell McClendon 313-220-6211. 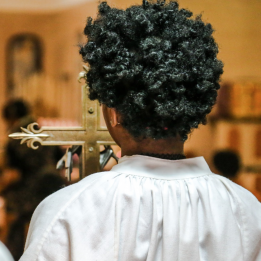 Extraordinary Minister of the Eucharist: As active, confirmed teen and adult members of the parish, these ministers offer their services at whichever Mass they are attending. Mandatory training provided. Sacristan: About once a month, prepare the church for Mass, neaten the sacristy and sanctuary after Mass, and properly clean the vessels. Must arrive 25 min. before Mass and stay after. Training provided. Laundry sacristans: Launder the altar linens (and sometimes albs) on a rotating basis. Each week of your assigned month, get linens from the Sacristy, wash, iron, and returned for the next weekend. Committal Assistance – Help the presider at the funeral liturgy and then accompany the family to the cemetery to lead final prayers of Committal. Training provided. Lead Prayers at Funeral Wake – Lead prayers at the funeral home the evening before a funeral. Training provided. Lector: Lectors bring the Scriptures to life for all to hear at Mass. Mastery of public speaking is essential for proclaiming the Word of God. Frequency will depend upon the number of volunteers. Wedding Liturgy Assistant: Co-direct wedding rehearsals and be present at weddings to see that all runs smoothly. 8-10 weddings with rehearsals per year. Interested applicants please check the box on the Sign Up Form. Contact: Kelley Daley 313-883-2868. Usher: Friendly, helpful ministers of hospitality at regular weekend liturgies, concerts, funerals, and large Archdiocesan events. Teams rotate weekend; special events have independent choice.